Thursday night: Informal Meet and Greet @ local hotspot. (TBA) Optional, but encouraged. As the kick-off session of the week, this time will be used to give an introduction and set the tone for the weekend, giving context, and what to expect. Intention is to ground in as a group, and give details, logistics, maps, schedules, and what to expect of weekend. The remainder of time will be a short yoga practice for belly dancers. Please bring a yoga mat. Getting back to the roots and foundation from which everything else has evolved, this is a special course featuring the basic structure of ATS (American Tribal Style Belly Dance). Simple explanation and demonstration of the ATS concept, taking into account the special needs of Fusion Dancers. Carolena is the originatrix of Anticancer and ATS. She's like your grandma, and she loves you. 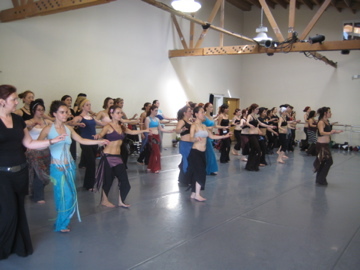 Enhance and deepen your understanding of tribal fusion bellydance fundamentals. Over 7 years of performing and teaching with Ultra Gypsy during a formative time for tribal fusion, has given Rose unique insight to sharing the essentials of great technique, dynamic presence and the joy of this dance form. This Fusion Foundation workshop will also include Rose's signature Core Integration material. We will explore technique drills for layering, shimmies, locks and slinky slow movements that form the foundation of tribal fusion. You will also learn a short choreography that highlights the evolution of the tribal movement vocabulary in to contemporary fusion belly dance. Core integration yoga for belly dance, and applying it to ridiculously slow/slinky/snake-like dancing. With Deb Rubin (description TBA) Please bring a yoga mat. 1:00-3:30 PM—Zoe Jakes - Unleash Your Inner Spaz - New combos just for Mecca!!! Fancy kicks, tight spins and those elusive concepts to take pops and locks to the next level by mixing the liquid smoothness of a snake with hits and stops that look almost inhuman. This workshop will focus on ways to perform with passionate expression while maintaining control and grace. These concepts will be fully broken down using short combinations as examples so the student is able to get a real understanding of the mechanisms behind them. Prepare to sweat. Alot. We encourage you to use this time to explore the vibrant artistry and creative energy of San Francisco. Immerse yourself in the city life and feel how it inspires you! Shop, eat, people watch, or relax. Raid the fabric stores or pursue the thrift stores to see where your next costume inspiration will come from. Chill out, have a drink, and get ready for the big night time event. **Upon arrival to SF Mecca, we will provide you with “the Tribal Belly dancer’s map of SF”, equipped with recommendations for some of our favorite shopping, restaurants, parks, and hot spots. Including restaurants within walking distance to the Sat. night venue. 3:30 PM–6:30 PM—The MECCA BAZAAR! Exclusive Vending from some of the Bay Area’s hottest designers! Schmooze with the musicians and teachers, or shop til you drop! We are honored to feature some of San Francisco’s hottest designers who are the needle and thread behind the cutting edge trends shaping the tribal fusion aesthetic world-wide. Featuring: Katherine Summer, Minerva's Antennae, Wendy Darling, Rose Hips Designs, Five & Diamond, HippStir Belts, Lee Kobus, Medina Maitraya, and more! 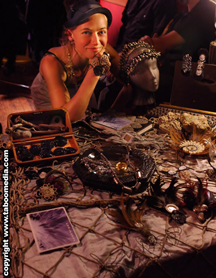 Plus merchandise available from the Indigo, FatChanceBellyDance, Beats Antique, Mira Mania Designs, Black Lotus and more! No immersion into the heart of the SF tribal fusion scene would be complete without a stop off at our beloved Amnesia. Gypsies, tramps, punks and thieves. Vagabonds and circus freaks. I think it’s safe to say that most of the SF belly dancers and musicians have graced this stage on more than one occasion, and usually in combination and collaboration with each other. Whether it’s a CD release party, home of the monthly Baxtalo Drom, or just a casual late night dance party and hang out with friends…Amnesia IS the red light district of the bohemian bellydance underworld that is San Francisco. So come chill out, decompress, and enjoy the local flavor. Featuring the MECCA house band of live musicians (Dan Cantrell & Friends). And SF Mecca performances by the lovely Frederique! and Amy Sigil/UNMATA! Also, an opportunity for YOU to get up and dance, accompanied by some of the hottest musicians in the biz…. Tools for dancers ready to figure out how they want to perform and what they want to convey. We’ll work on focus, conveying emotion, expression, all while actually dancing. Think ‘Bellydance Theatrics 101.’ Intermediate level - some belly dance experience highly recommended. 11:30 AM-1:30 PM—Modern Fusion & Movement Invention for Bellydance—Cera Byer. This workshop is all about destroying boundaries, incorporating gestural movement, and working contemporary staging, costuming, and choreographic techniques into your Bellydance vocabulary. Our warm up will focus on developing movements that start in Bellydance and then take a sharp left, exploring space and growing outward from the center. Then we'll move into modern fusion combos, and begin to develop our own movements that we can use in creating combos and choreographies. Come away challenged, inspired, and with lots to work on at home. "I sooo wish I could make it! It sounds like great fun. Good idea, by the way! We need an event in the heart of the city, and I hope it goes wonderfully for years to come! !